Accountability. There is both an individual and a corporate accountability in a choir. Many rehearsals come before any service or concert performance, and singers have a responsibility to attend these rehearsals in order to learn the music — but also to put in the time outside of rehearsal to learn any parts that are not mastered during rehearsals. Anyone who chooses not to do so will likely be called out by fellow singers as well as by the conductor. Similarly, in many archival shops, archivists have discrete tasks to perform that come together to preserve and provide access to collections. The work of arrangement and description, preservation, and reference are all necessary, and if any person along the way doesn’t complete a job, the whole product suffers. Being part of a whole. Unlike the work of soloists, choral singing demands a consistent tone and volume from all singers. A singer who has too bright a tone or who sings more loudly than anyone else will stand out in an inappropriate way for choral singing. I argue that archivists also need to see the bigger picture, from records creation to accessioning to preservation to access. Especially for archivists in government positions, it can be useful to encourage conversations about how records are created and maintained rather than merely waiting around for the occasional deliveries of archival materials. Protocols and procedures. Just like archivists are fond of protocols and procedures for everything from donor agreements to finding aids, choral singing demands a uniformity from all performers. Singers walk onto stage carrying music in the hand away from the audience. When accompanied by an orchestra, singers rise when the concertmaster enters. The oboe is usually the instrument that plays the A pitch to which the other instruments tune. Absolutely no talking should occur during this tuning. And just as archivists expect patrons to follow certain rules when they visit our repositories, musicians for a formal classical concert expect the audience to remain quiet during the performance and to clap only at the end of the piece, when the conductor lowers the baton. These sorts of rules allow both performers and audience members to have certain expectations that can transcend locale, just like writing finding aids with certain metadata standards allows for the creation of union catalogs of archival materials. These lines belong to Antonio in Act 2, Scene 1 of William Shakespeare’s The Tempest, written in the early 17th century. Antonio tries to convince Sebastian to murder his brother and assume the throne as the King of Naples. Antonio had previously usurped his own brother’s position as Duke of Milan — so Prospero retaliates by using his powers of sorcery to create a storm that causes Antonio and King Alonso of Naples to believe they are shipwrecked and marooned on the island. Spoiler alert: Antonio and Sebastian don’t succeed in killing King Alonso. Where Antonio was suggesting some sort of fated destiny, these lines have been embraced over the years by archivists who who interpret them as evidence of the value of history as a springboard for later events. 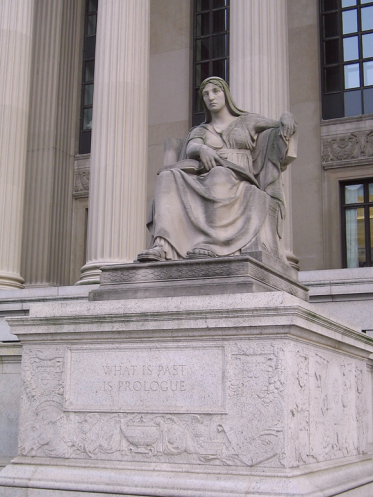 These words are inscribed on Future, Robert Aitken’s 1935 statue located on the northeast corner of the National Archives Building in Washington, D.C.
I’m taking my dive into context in a slightly different direction this week. Several times, I’ve had the pleasure of singing Gustav Mahler’s 2nd Symphony, known as the “Resurrection” symphony. While it is primarily an orchestral work, in the final movement, the chorus along with soloists give voice to the words of resurrection. I knew the text isn’t biblical in origin, so I set out to discover the story. YES! thou wilt rise, wilt rise as Jesus rose, / My dust, from brief repose. / Endless to live / Will He who made thee give. / Praise ye the Lord. Again to bloom the seed the sower sows. / The Lord of harvest goes / Gathering the sheaves, / Death’s sickle reaps and heaves. / Praise ye the Lord. Oh! day of thankfulness and joyful tears, / The day when God appears! / When ‘neath the sod / I have slept long, my God / Will wake me up. Then shall we be like unto them that dream, / And into joy supreme / With Jesus go. / The pilgrim then shall know / Sorrow no more. Ah! then my Saviour me shall lead in grace / To the Most Holy Place, / If Him I serve / This side the veil, nor swerve. / Praise ye the Lord. Nothing is lost to you! Yours is what you longed for! Yours what you loved, what you fought for! O believe: you were not born in vain! You have not lived in vain, suffered in vain! What has arisen must pass! What has passed must rise! O pain! You all-pervasive one! From you I am wrested! O death! You all-conquering one! To the light to which no eye has penetrated! I will die, so as to live! After being on loan at the New York’s Pierpont Morgan Library for many years, the manuscript for this symphony sold at auction in 2016 and is now held in private hands. P.S. If today’s post doesn’t fill all of your archival reading needs, take a look at my case study that was published this week by SAA’s Government Records Section about the functional analysis initiative at the State Archives of North Carolina. The quote above comes from “The Web of Circumstance,” which was published in 1899 as part of a story collection entitled The Wife of His Youth. Only recently have I learned more about Chesnutt’s personal history. He was born in 1858 to free mulattoes, and his family moved to Fayetteville, North Carolina, after the Civil War. He attended Howard School and taught in several places before becoming the principal of the new State Colored Normal School for teacher training in 1879. In 1883, he moved north to pursue his writing dream, though he still set his stories primarily in the American South. Although a number of his stories were published in The Atlantic Monthly, his foray into novel writing was less successful, and writing never became a full-time profession for him. However, many credit him for laying the foundation for the success of the Harlem Renaissance. Chesnutt wound up living in Cleveland, passed the state bar examination in Ohio, and established his own court reporting firm. He died in 1932, and his papers can be found at Fayetteville State University — the successor to the State Colored Normal School — where the special collections are named in his honor. I’ve previously looked at archival work from the perspectives of tennis and football, so now in honor of Final Four weekend, I’m going to do the same thing for basketball. Preparation. Successful basketball coaches and players spend time before games studying their competition, looking for weaknesses and trying to diagnose the best ways to approach the strengths of the opponent. While archivists don’t have exactly have opponents, it is vital that we approach our projects only after thorough preparation. Identifying low-hanging fruit can generate early buy-in by giving people easy successes, and planning how to handle the difficult parts of the project can give people confidence that the project won’t founder due to unanticipated difficulties. The advantage of this system is that everyone has clearly defined responsibilities — on offense, on defense, while boxing out for rebounds. Until the 1970s, girls’ high school basketball was even more specialized, with three forwards playing on the offensive end of the court and three guards playing on the defensive end of the court and no one playing full court. In recent years, coaches both at the college and professional levels have begun talking of positionless basketball. The basic idea is to build a game plan around the strengths of individual players and not constrain their play with any notions of what a particular position player “should” or “should not” be doing. The Golden State Warriors employ this style of play. Archivists have certainly embraced the idea of specialization. You need look no further than the 45 sections found within the Society of American Archivists to realize that we like to define our jobs clearly and assume there’s something to be gained from focusing on a very narrow slice of the archival world. But I find myself wondering if the profession wouldn’t be better off with more cross-pollination and less working in independent silos. Probably the most obvious example is that many repositories handle paper and digital records separately — especially with arrangement and description but sometimes also with other archival functions. Perhaps the lone arrangers of our profession could help us all learn something about the agility that could come from having a more positionless profession. Points of emphasis. For the last number of years, the NCAA has identified points of emphasis for referees of the college basketball game. These are the rules on which referees are expected to focus — for instance, in men’s college basketball this year, one point of emphasis was making sure that all screens were set legally. Sometimes these points of emphasis accompany tweaks to the rules, and sometimes they are designed to make games more interesting or protect players from unnecessarily physical play. Archivists do something similar by having a particular focus for annual meetings — but this emphasis only affects those who are able to attend the meeting. Perhaps the “One Book, One Profession” initiative will catch on and we can begin having some dialogues across the profession about important issues. Reflection. Athletes in general embrace the concept of “next play” — the idea that while involved in competition, it’s important not to dwell on past mistakes but instead to focus on what’s coming next. However, great basketball players also spend a lot of time away from the court reviewing their play — analyzing what things were successful and what things were problematic. Archivists would do well to do the same — keeping an eye on what’s coming up next but also taking the time to debrief, especially at the conclusion of projects, to determine what worked well and could be replicated on other projects and what caused problems and should be avoided at all costs. We could certainly benefit from acknowledging our mistakes so we can learn from them rather than repeating them.